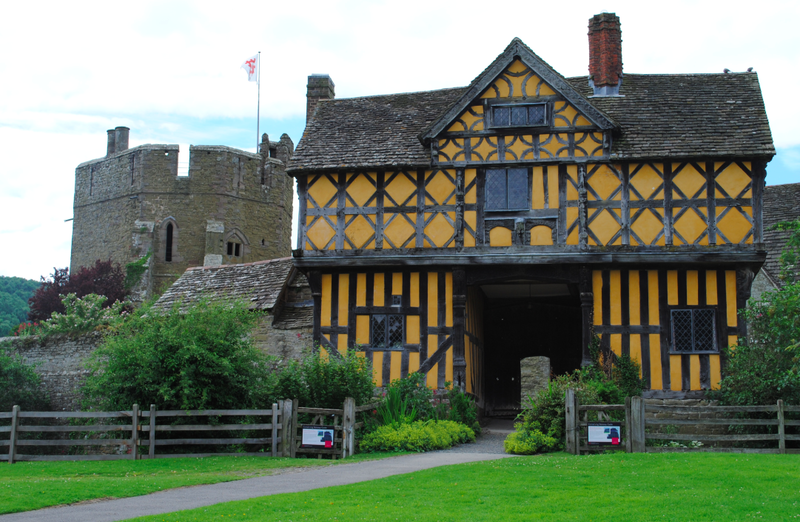 At the time of the compilation of the Domesday Book in 1086, Stokesay formed part of a prosperous estate called Stoches. 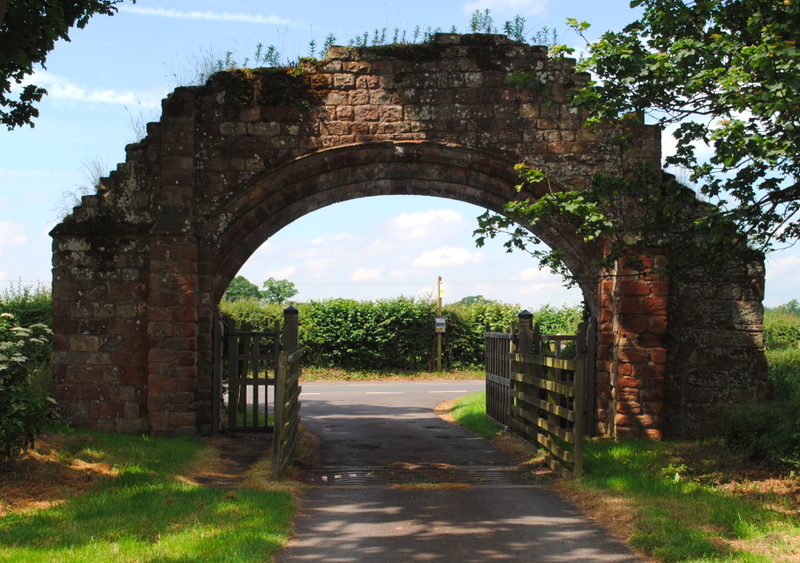 An Anglo-Saxon word which suggests the presence of a cattle farm, Stoches was held by the Lacy family who became lords of Weobley and Ludlow. The first recorded tenants appear to have built a small keep with an adjacent hall (Jenkins, 2003). 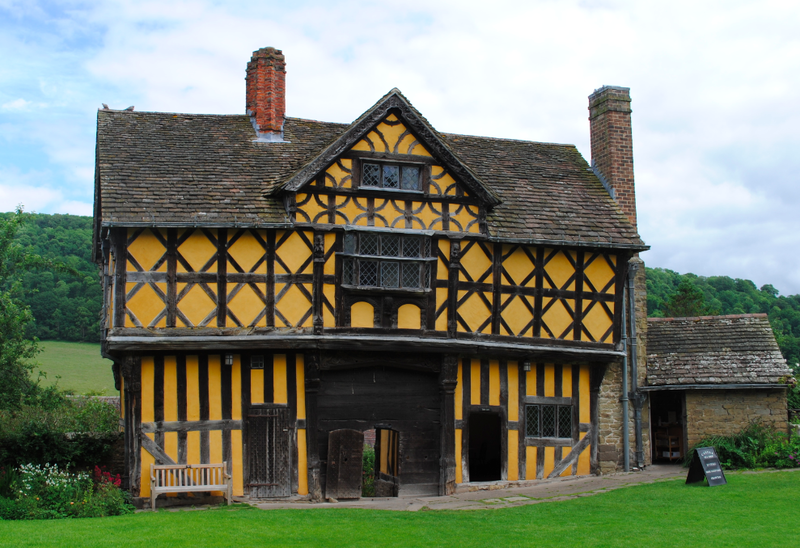 Dendrochronological evidence shows that building at Stokesay did not begin until after 1285 when the local wool merchant, Laurence of Ludlow, owned the rights of the manor – purchased some four year earlier. Laurence erected the impressive manor house with crenellated tower and built walls round an inner bailey. 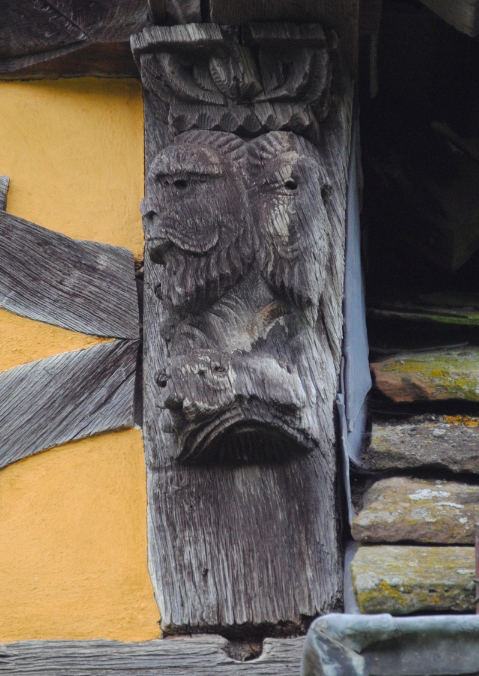 His family occupied Stokesay until 1598. While Stokesay is a castle in name only, when the antiquary John Leyland passed through Shropshire in 1543 he described it as “buildid like a castel.” The title of Stokesay Castle only became common during the 16th and 17th centuries which no doubt reflected the social pretensions of its owners and as Alec Clifton-Taylor (1986) notes, “a castle was a good address.” Although a stone curtain wall was built to enclose Stokesay, the present gatehouse was not built until 1640. Nothing remains of the original gatehouse which was likely to have been of stone construction (Summerson, 2009). Unique to the Middle Ages, castles, or feudal residences, were more often than not lived in than fought over. Simple gate towers were in use throughout the medieval period, usually as secondary gates, and the ostentatious embellishment of gatehouses had their part to play from the 14th century onwards (Friar, 2003). At some point the gatehouse became a refuge for a coiner and by 1877 there was a caretaker living in the building. When the architectural historian Thomas Hudson Turner visited Stokesay in 1845, he described it as “one of the most perfect and interesting buildings which we possess.” Following the death of Jewell Allcroft in 1992, Stokesay was placed in the guardianship of English Heritage and a four year campaign of restoration got underway. Referred to as domus defensabiles in the Domesday Book, fortified homesteads were both a residence and a personal stronghold. The inherent desire to provide a facade with a “satisfying architectural climax” (Friar, 2003) is more than evident at Stokesay. What survives at Stokesay Castle is a remarkable example of a fortified manor house and the “breezy Jacobean gatehouse is a gem” (Jenkins, 2003). 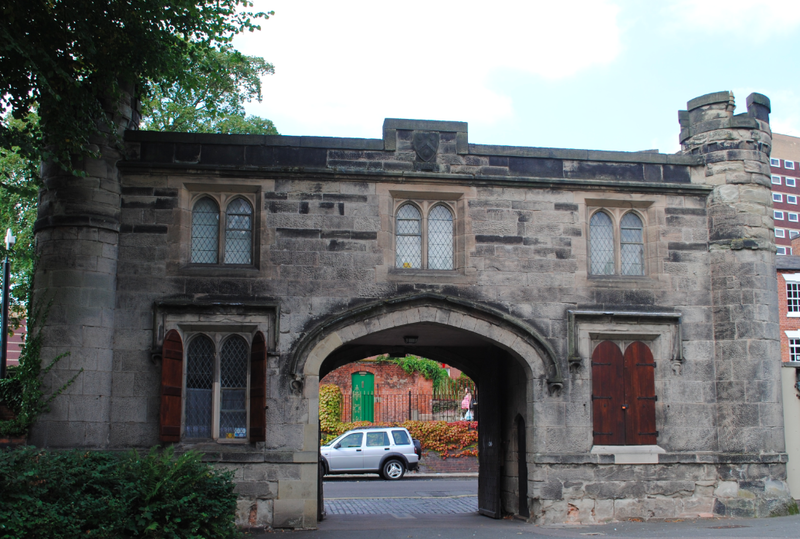 The gatehouse is Grade I Listed and a Scheduled Ancient Monument. Badde’s Ley, Badde’s wood or clearing dates back to before the Conquest. The Saxon holder in 1066, Leuvinus, was replaced by the Norman knight Geoffrey de Wirce who was granted the manor by William the Conqueror. Walter de Bisege owned the manor 200 years later and his grand-daughter married Sir Thomas de Clinton – hence where Baddesley Clinton derives. With a number of defensive ditches being dug at the end of the 13th century when the Forest of Arden was being settled, it is likely that the moat at Baddesley dates from this time and that Sir Thomas may have been the first to construct a house on the site of the present building. Through the marriage of Nicholas Brome’s daughter Constance to Edward Ferrers, the Baddesley Clinton estate has passed through 13 generations of the Ferrers family until the mid 20th century. One of the most notable occupants at Baddesley is Henry Ferrers. Nicknamed the Antiquary, Henry was a historian who introduced much of the 16th century heraldic glass and the oak panelling in the Great Hall. The historian William Camden described Henry as “a man both for parentage and for knowledge of antiquary very commendable… who hath at all times courteously shewed me the right way when I was out, and from his candle, as it were, hath lighted mine.” Spending much of his life in historical research, he had planned to complete a history of the kings and queens of England. It is believed that there was a manor house on the site from around 1230, shortly after the estate came into the hands of the de Clinton family. Originally comprising a group of buildings surrounded by the moat, the medieval gatehouse would have served as the entrance to the original great hall and would have been a timber framed structure. 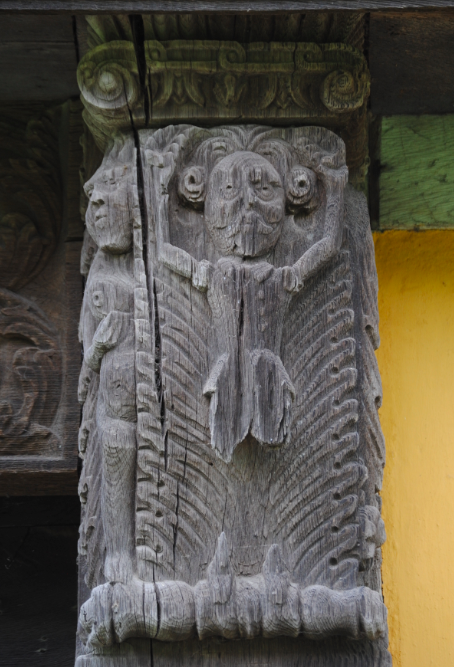 With little remaining of the original house, the earliest visible elements date from the 15th and 16th centuries. 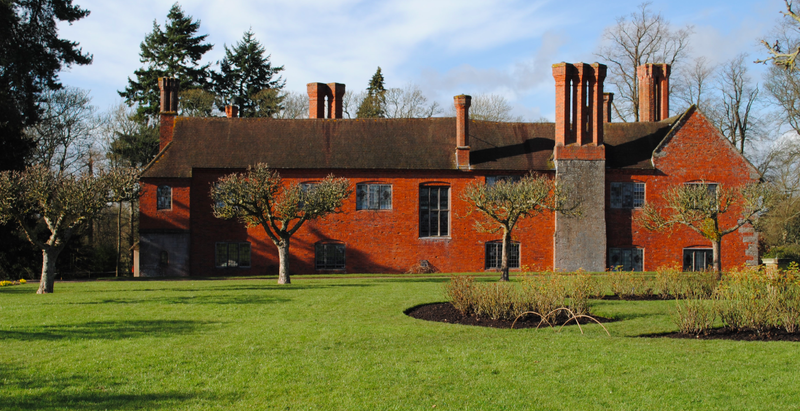 A programme of rebuilding was underway in 1459 when John Brome acquired the manor which included a new L-shaped chamber block, a south-east tower and additional chambers. A new gatehouse range was added by Edward Ferrers during his rebuilding between 1526-1536. 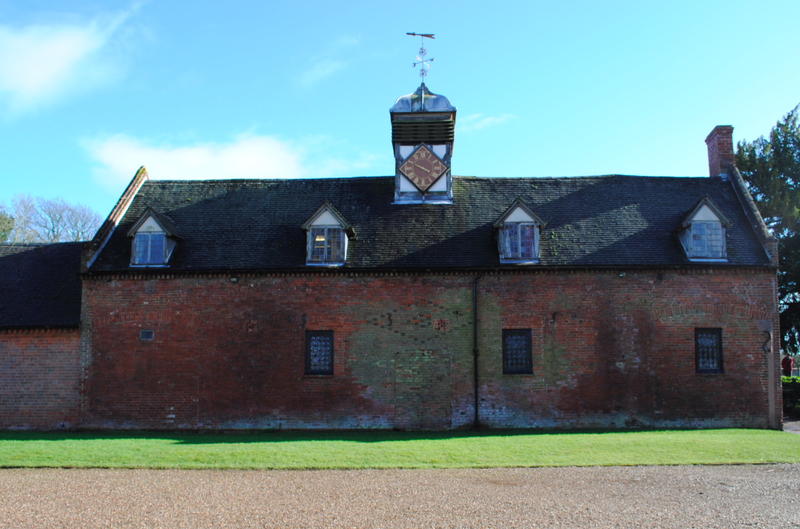 Henry Ferrers began a programme of improvements in 1574 which included alterations to the Gatehouse Range (new roof) and the rebuilding of the East Range, new staircases and first floor corridors for increased privacy. 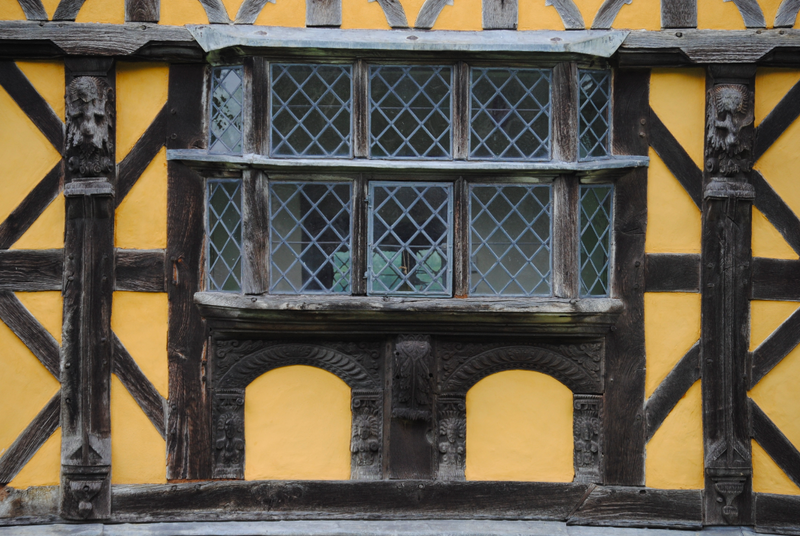 During the 17th century, the gatehouse had mullioned and transomed windows installed when a new Great Parlour was created by a rearrangement of the dividing walls over the gatehouse. 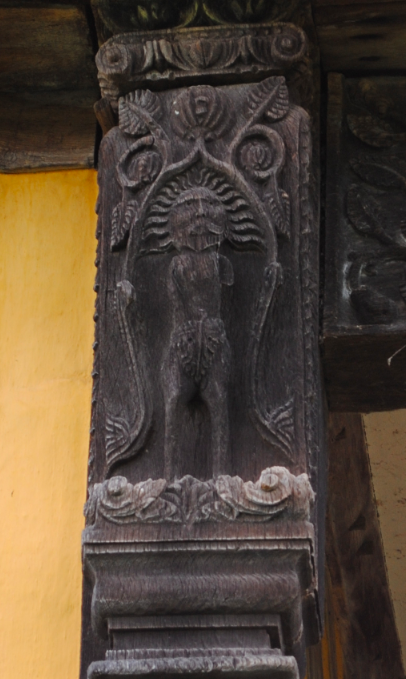 Domestic gatehouses were not generally defensive in the military sense but gave sufficient protection against bands of marauders and provided a suitable place for the emblems of the owner, founder or patron. Often containing closets used as secret hiding spaces, houses of the late 16th century had vaulted cellars and tunnels connected with the sewage. A tunnel some 30 inches wide passes below the west wing at Baddesley which was constructed as a sewer to receive the drainage of the house (Wood, 1994). The level of the moat was raised at intervals to clean it with steps at one end allowing access for a servant to brush it out. During the times of religious persecution, the tunnel was transformed into a hide for Catholic priests by the 16th century architect Nicholas Owen, a specialist in building priest holes. Known as Little John, Owen trained as a carpenter and was a personal servant of Father John Gerard, the Jesuit Superior. With increased financial pressures, Henry Ferrers rented Baddesley out in 1590 to the daughters of Lord Vaux who were ardent Catholics. 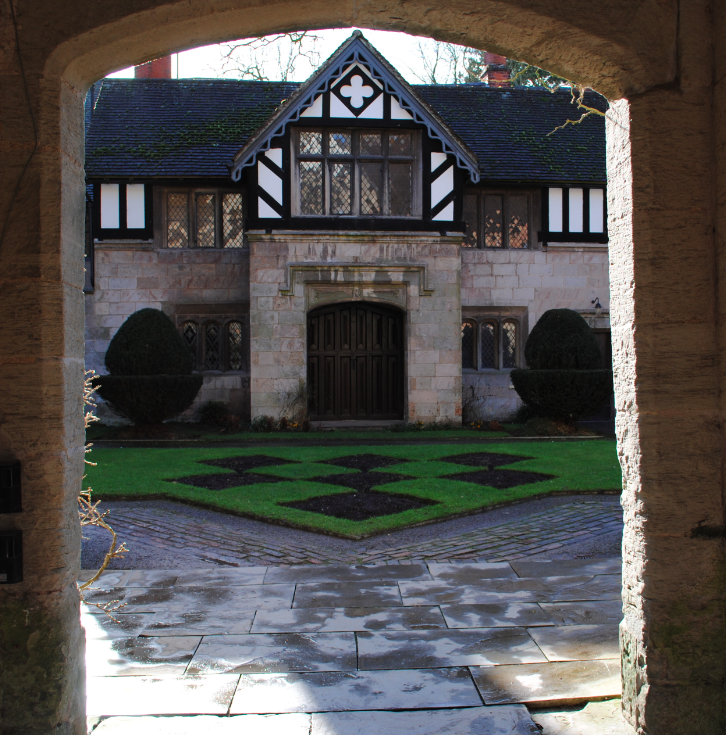 The Vaux sisters allowed a number of English Jesuit priests to use Baddesley as a base for missionary work and apparently did so without Henry’s knowledge. 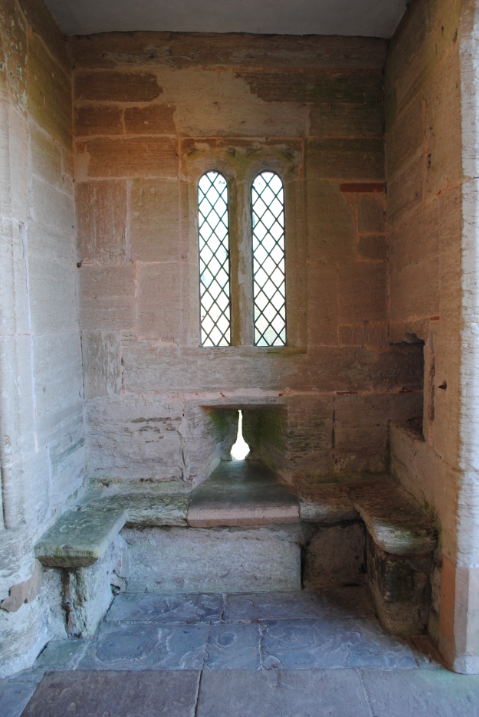 Following the Act of Uniformity in 1587, it was a treasonable offence to be or to harbour a Roman Catholic priest in your house so the Vaux sisters created a number of hiding places incase Baddesley was visited by the priest hunters. Despite the threat posed by the Act and risking their lives, the servants remained loyal. 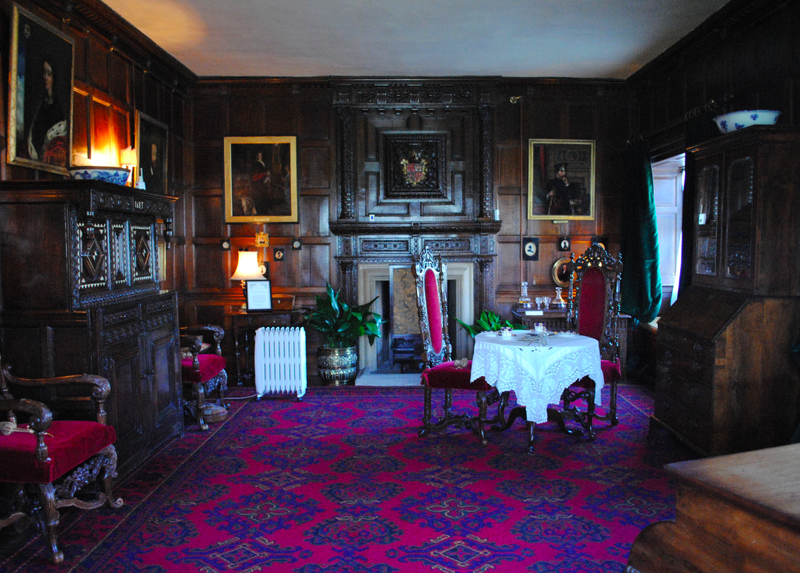 The great hall usually met several social needs, such as being a point of assembly for tenants, legal and administration purposes and was the main living room for the lord and their family. The central hearth, which necessitated a high roof, was gradually superseded by a wall fireplace, particularly from the 15th century onwards (Wood, 1994). It also became common during Elizabethan times for both the hall and the parlour to be “ceiled” with plastering becoming usual for ornament and effective protection against fire (Summerson, 1953). 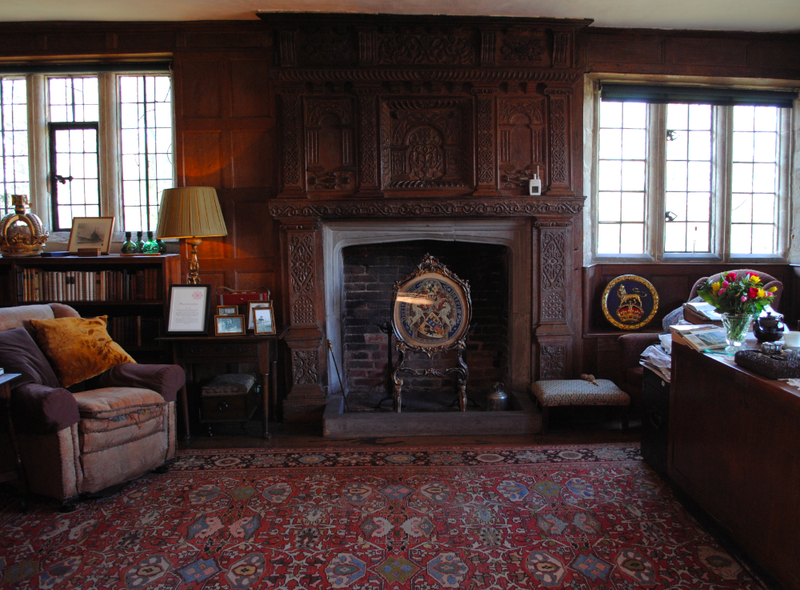 The fabulous fireplace at Baddesley is finely carved and derives from the printed designs in Sebastiano Serlio’s Five Books of Architecture and was moved to the Great Hall from the Great Parlour in 1572. Thomas Ferrers moved into Baddesey in 1747 and created a central door opposite the chimneypiece and added a plain plaster ceiling in this room. Concealing the 16th century timbers, the fine ceiling was not revealed until after a fire in 1940. The Library (above and below) was adapted from a first floor chamber and was created during the 17th century. In later centuries, this room was a bedroom and became known as the Ghost Bedroom. 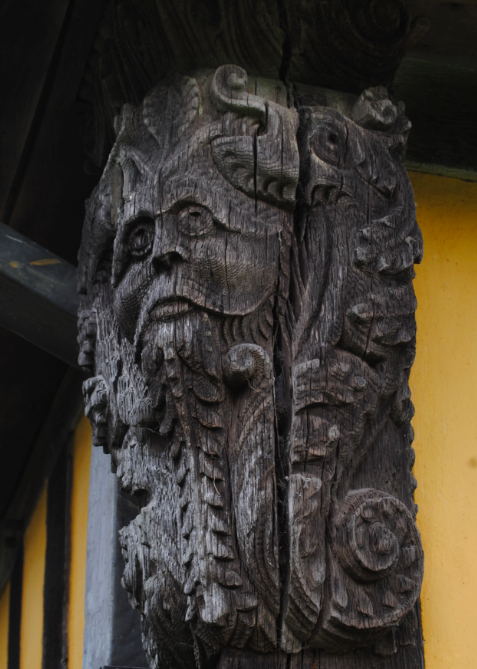 The fantastic carved overmantel is dated 1634 and was installed by Edward Ferrers. The beautiful oak lectern in the form of an eagle, made from a ship’s figurehead and dating to circa 1800, was introduced by Thomas Ferrers-Walker and his son in the 19th century. Thomas was responsible for recreating the Sacristy and removing an 18th century chimneystack. 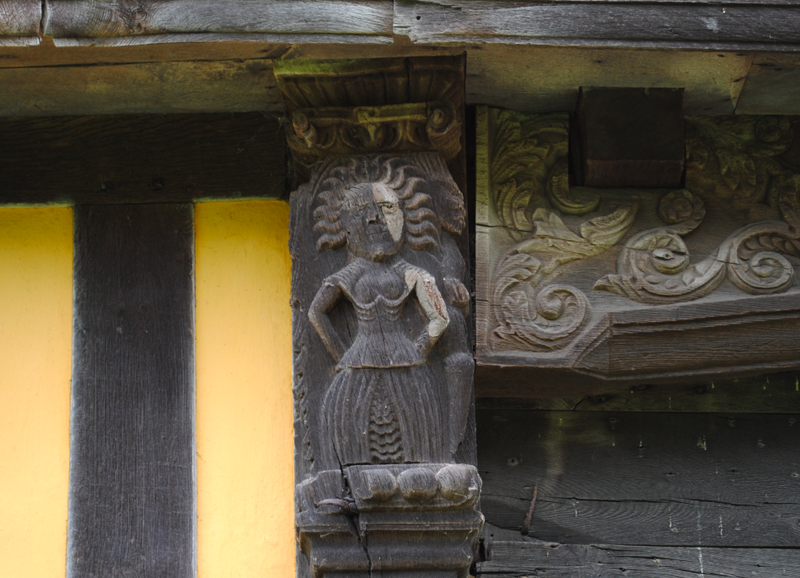 Thomas and his wife Undine also stripped back the many layers of paint in some of the rooms, repaired timberwork and revealed the ceiling in the Great Hall. 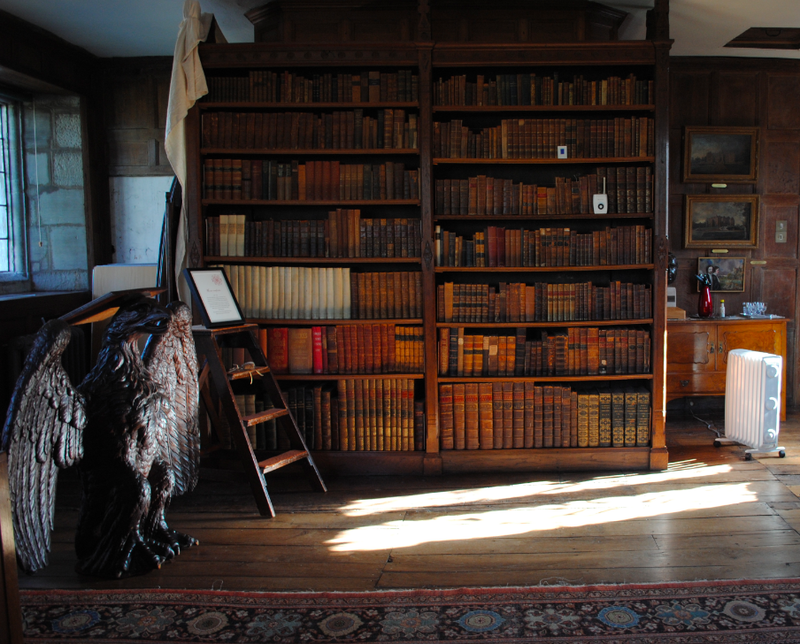 Much of the furniture in the room is Georgian and many of the books are concerned with history and genealogy. 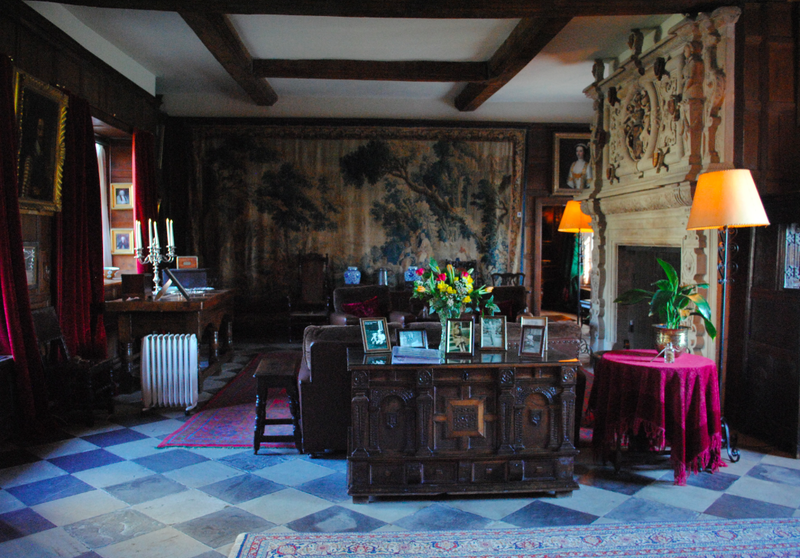 Adjoining the Great Hall are the Drawing Room (below) and the Dining Room. Rebuilt in around 1790, the Drawing Room features glass, oak panelling and armorial chimneypiece that were re-used from other rooms in the house. One of the stained glass windows in the room is 16th century while the other was introduced in the 1890’s by Rebecca in memory of her two husbands. Rebecca Dulibella Orpen was born in 1830 and lived in County Cork with her aunt Lady Chatterton. The story goes that when the wealthy Edward Dering came to ask permission to marry Rebecca, the 53 year old Lady Chatterton misunderstood and announced to the world that she had accepted his proposal. Apparently too chivalrous to withdraw, Edward did indeed marry Lady Chatterton. Marmion Ferrers, the last Ferrers in the direct male line to live at Baddesley, married Rebecca in 1867. A talented and prolific painter, Rebecca filled the house with family portraits and many views of Baddesley Clinton. These four individuals – Marmion, Rebecca, Lady Chatterton and Edward Dering – became known as the Quartet. Living a “gentle Tennysonian existence” (Musson, 2015), the two inseparable couples restored and refurnished the house, recreated the Chapel and extended the servants wing. Lady Chatterton died in 1876 and following the death of Marmion in 1884, Edward finally married his true love Rebecca in 1885. After Edward’s death in 1892, Rebecca continued to live at Baddesley with her devoted servants until her death in 1923. 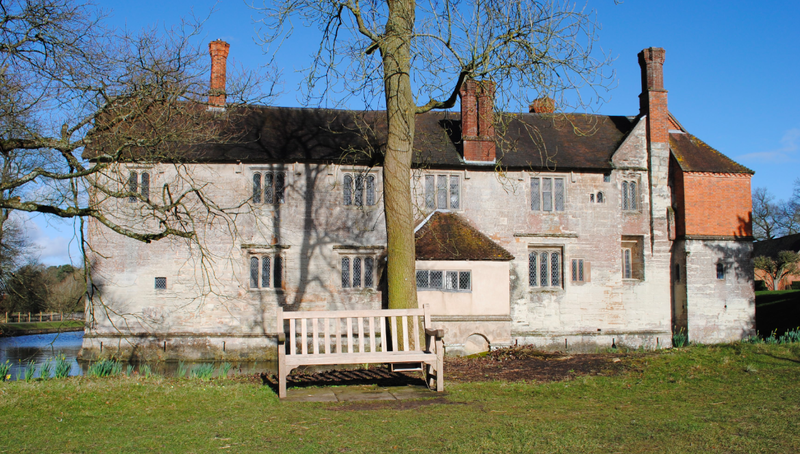 After the death of Rebecca, Baddesley Clinton passed to her first husband’s great nephew. Much of the furniture was sold to Baron Ash at Packwood House (also in Warwickshire) as Ferrers relatives struggled to keep the house going. In 1940 the house was sold to Thomas Walker, a relation of the Ferrers family, and in 1980, his son, Thomas Ferrers-Walker, transferred it to the National Trust through National Land Fund procedures. The National Trust opened the house to visitors in 1982 and with the landscape that surrounds this idyllic ancient manor house being recognised for its environmental importance, there is a project supported by Natural England to restore the traditional character of the fields and park. Baddesley Clinton has a fantastic variety of architectural features that reflect both the changing fashions and the uses of this historic manor house. 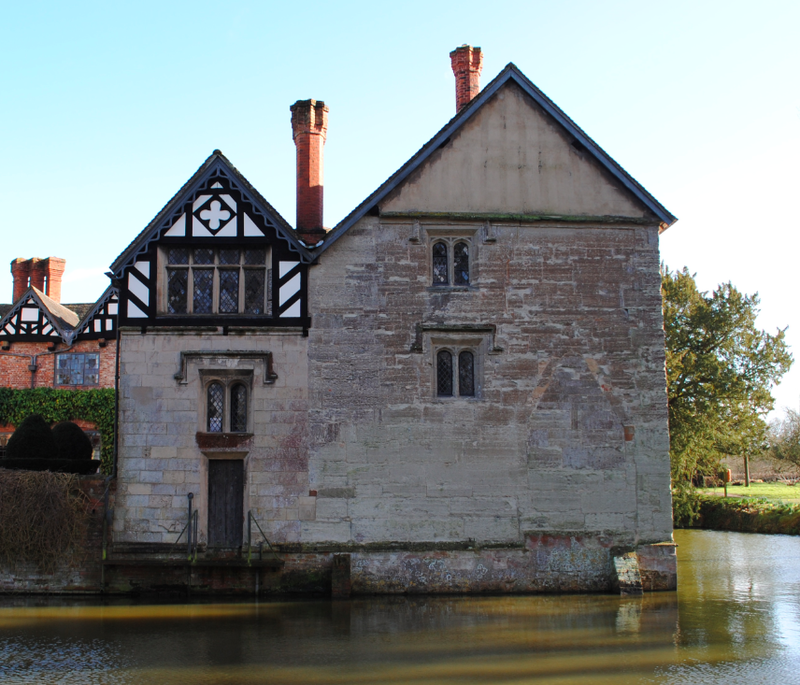 Baddesley Clinton is Grade I Listed. To the west of Lanercost Priory stands the remains of the inner arch of the priory gatehouse. Forming a link between the outside world and the canons inside, the surviving part of the outer gatehouse above would have faced into the precinct and the building would have extended to the edge of the road. Dating to the early 13th century, the gatehouse was constructed of squared calciferous sandstone and coursed rubble which was taken from the nearby Roman wall. 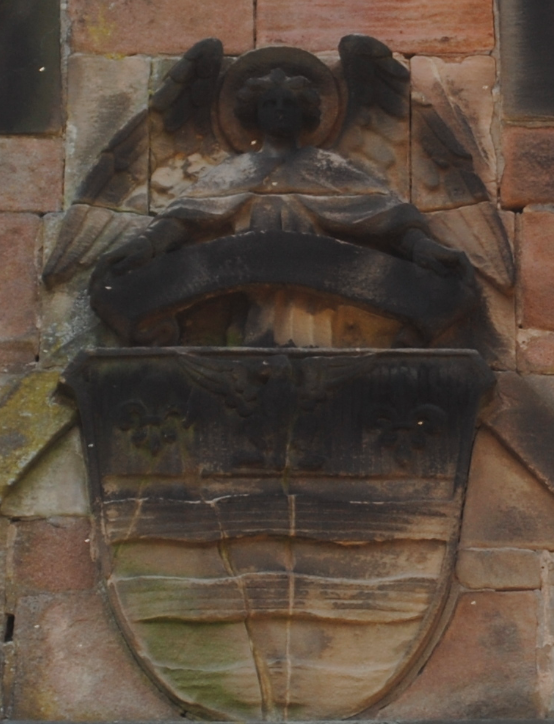 The gatehouse remains feature a chamfered segmental arch of three orders, hood mould and moulded corbel stops with fragments of fan vaulting. The current gates reflect the Arts & Crafts interests of George Howard, ninth Earl of Carlisle, who erected them during his restorations. The surviving inner arch of the gatehouse is Grade I Listed. 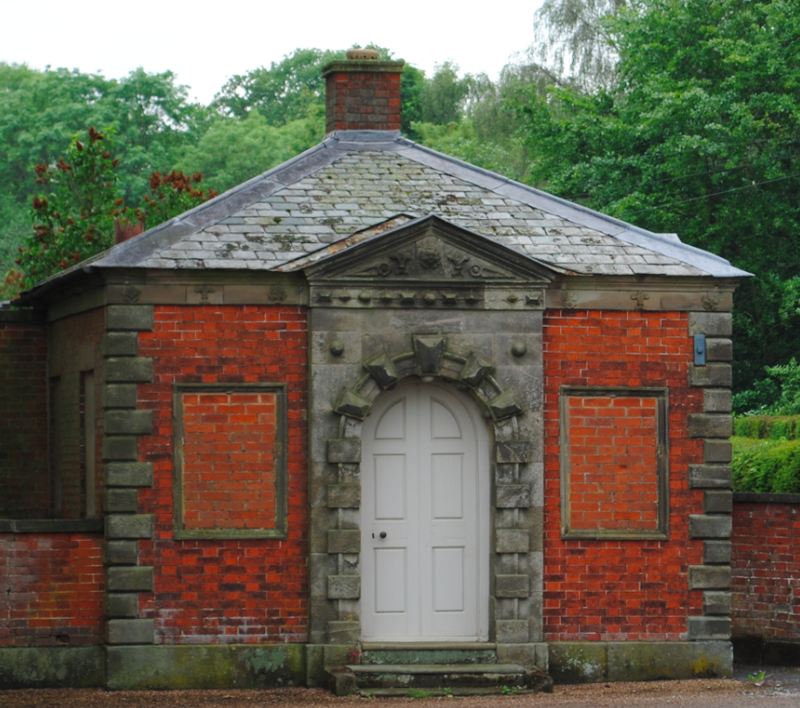 Situated next to the entrance gates of Eggleston Hall is Low Lodge. Dating to circa 1827, the Lodge is constructed of coursed sandstone ashlar. The design of the one storey building is attributed to the 19th century English architect Ignatius Bonomi. 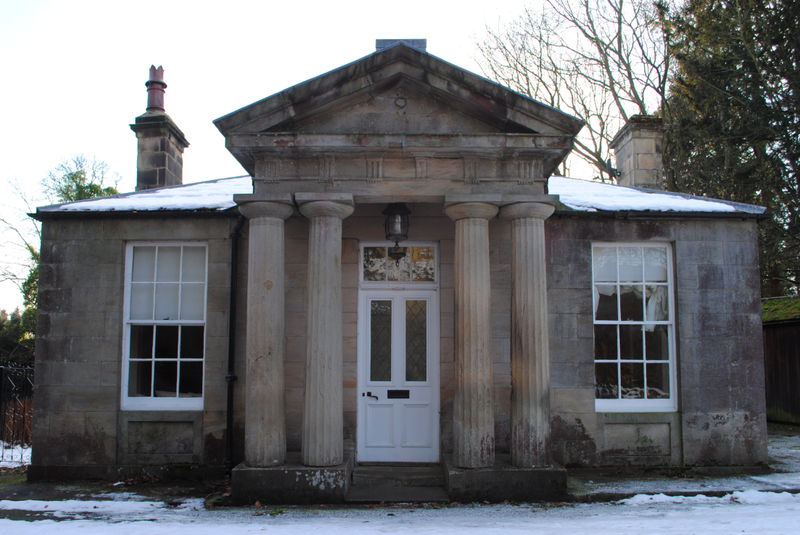 Built in the Greek style, the three bay Lodge features sash windows and paired Doric columns on plinths which support the pedimented entablature. Low Lodge is Grade II Listed. Located on Stapenhill Road is the cemetery and chapels of Stapenhill, now in the parish of Brizlincote. 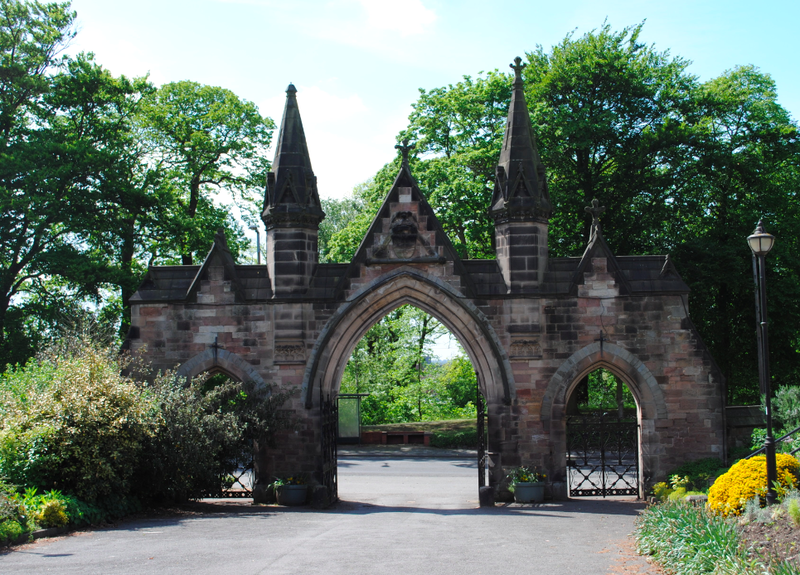 The stone archways at the entrance of the cemetery lead to the original 12 acre site (now over 30 acres) which was purchased from the Marquis of Anglesey in 1864. The Gothic archways feature poppy head finials, a central carriage arch, High Victorian Gothic pedestrian side arches and are Grade II listed. Holloway Lodge dates to 1810 and was built as part of an extensive restoration programme at Tamworth Castle. The single storey gatehouse originally had battlemented crenellations which were raised when the Borough Council added another floor. Built in a Gothic Revival style, the gatehouse has a central carriage entrance and round angle turrets. 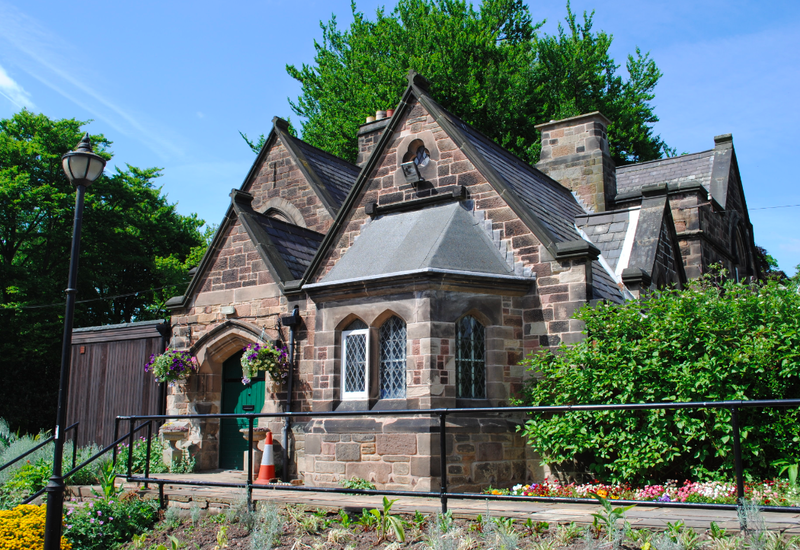 Constructed of ashlar, Holloway Lodge is Grade II Listed.